Exceptional quality and contemporary styling are the key features of the Flash Furniture Contemporary Glacier Olive Microfiber Chaise Rocker Recliner. 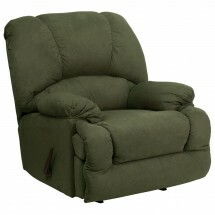 Featuring high quality foam with microfiber upholstery, this recliner allows you to sink into its softness after a busy day. 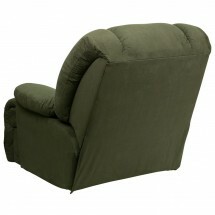 For an outstanding seating experience, this recliner has a plush pillow back and arms for excellent support. To easily change its position, this recliner is built with a lever recliner that allows you to lean back and put your feet up. 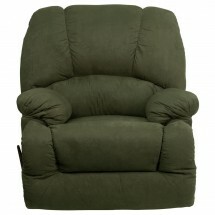 For convenient maintenance, this rocker recliner is easy to clean with a damp cloth. Dimension: 38" x 43" - 68" x 42-1/2"